"41UR315, Burial 24, Vessel 121" by Timothy K. Perttula and Robert Z. Selden Jr.
DECORATION (INCLUDING MOTIF AND ELEMENTS WHEN APPARENT): The lower rim panel has an unknown number of engraved concentric semi-circles that would have encircled the vessel. Each concentric semi-circle element is separated from the areas by a series of rectilinear zones filled with vertical hatched, horizontal hatched, or diagonal engraved lines. Ripley Engraved, var. 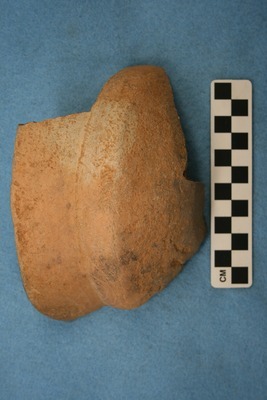 unspecified compound bowl, Vessel 121, Burial 24.